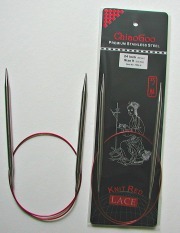 Chiagoo RED Lace Circular Needles are made from high quality premium stainless steel and feature a flexible, memory-free, red-nylon-coated steel cable with superior joins. Yarn easily glides from end to end ! The tips are pointier than other needle´s tips and there is no bend in the needle. Each size is conveniently laser imprinted on the needle in both the US and metric size.